Ingrid Ulrich : The woman who paddles faster than her shadow ! You are here: Home / Community blogs / Portrait / Ingrid Ulrich : The woman who paddles faster than her shadow ! 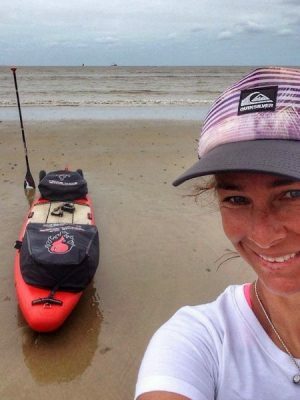 Ingrid Ulrich : THE WOMAN WHO PADDLES FASTER THAN HER SHADOW! That is Ingrid Ulricht’s message following her successful Med’Océan Stand UP Paddle undertaking from the Mediterranean (Port La Nouvelle) to the Atlantic (Royan): 600km in 10 days, 10 to 12 hours completely unaided! 2 months earlier, the Swiss, Micheline, paddled 450 Km from Bordeaux to Port la Nouvelle in 18 days, proving that anything is possible at 57; Pierre Paul Riquet’s age when he started the construction of the Canal du Midi. The canal celebrates its 350th anniversary in 2016. What an achievement! Unaided and 8 days less, 39 year old Ingrid managed to paddle 150 km more than Micheline from Port La Nouvelle. Her biggest challenge being the windy conditions on the Dordogne (130 km) and Fréjus / Corse (115km for it); this latter she paddled as part of a team. Due to the wind, it took longer than expected to cover the early stages. 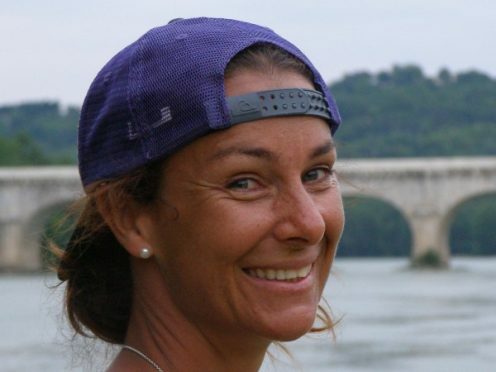 From Toulouse, Ingrid decided to paddle on the Garonne, taking advantage of the currents and avoiding the canal locks that have to be crossed foot. In this way, she recovered the day lost on the Canal du Midi and made it to Royan in 9.5 days! Ingrid wanted to prove to herself and others that we can regain confidence by surpassing ourselves. Despite blisters, Ingrid was all smiles when she arrived in Agen on the 6th day. She had been paddling 13 hour days, encountered obstacles including the Beauregard dam; it was clear that she had already achieved her goal and that nothing could prevent her from reaching Royan. Day 6, Agen via the Garonne with the the canal bridge in the background. In the words of Ingrid, “I will never forget that the Med’océan challenge was and above all a collective adventure. Thanks to all the people who helped me prior to and during my journey; I learnt something from all the people I met. A thought as well for my friends, family and acquaintances for their support, encouragement and affection. 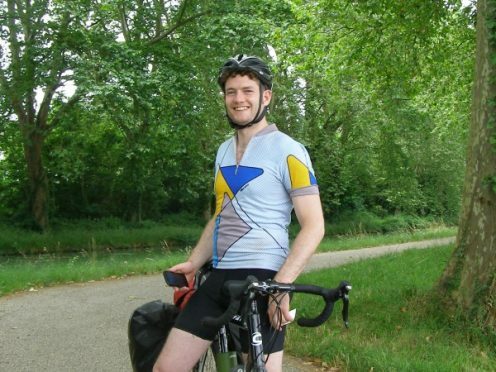 With Ingrid’s adventure, we wanted to highlight those who dare to challenge themselves as well as the great solidarity that exists among users of waterways (boat, canoe, bicycle, professional, resident, tourist ..). Ingrid’s progress was relayed via social media, inviting those who came across her to encourage her. Also by asking waterways professionals, residents and tourists to provide advice, ideas on safe places to spend the night or merely by lending her their telephones for a call… Over the 10 days, there was ample proof that solidarity and a sense of community really exists on and around our waterways! Judging by the numerous press articles and support from the public on social media during the journey, Ingrid has managed to become both a symbol of how to surpass oneself and the spirit of female liberty.